After I read the amazing Shadowfall a few years ago, I promised myself I wouldn’t read the sequel until the author has finished writing the rest of The Godslayer Chronicles. Having noted that Hinterland was published in 2006, and yet nine years later there was still no sign of the concluding book of the trilogy, I was reluctant to read the novel if there was a possibility the series had been abandoned. A little digging online unearthed this post indicating that the series had been extended to five books, rather than a trilogy followed by a sequel trilogy, and the publisher wouldn’t release the next book until all the remaining instalments had been written. It is now 2018 and I no longer have any expectation that The Godslayer Chronicles will ever be finished (especially as the author is much more popular writing thrillers under the name James Rollins) so I have decided to just bite the bullet and read Hinterland this month. I’m not really sure what made me pick this book up. Obviously, it’s one of those books that had lots of hype around it in 2017, and many readers hailed it as one of the best fantasy debuts published last year. Nonetheless, all the glowing reviews I have read for the book have actually convinced me that I’m not going to like it very much. But there’s only one way to know for certain, so Kings Of The Wyld will be my second read during April and, as always, I will approach the book with an open mind when I get to it. The best book I read last year was an urban fantasy / paranormal romance novel called Just Breathe. This book really took me by surprise given that it is a self-published perma-free title that I had zero expectations of before I read it. But I was blown away by how good it proved to be; it is everything I love about the works of Kim Harrison and J.R. Ward―combined into a disturbing, gut-wrenching story that is engrossing from beginning to end. I’ve been meaning to read this sequel ever since I finished reading Just Breathe, and hopefully I will finally get the chance to do so this month. I also have to admit I’m nervous about the prospect of being disappointed this time around because, unlike previously, my expectations are sky high. This book was completely unknown to me until about three weeks ago when book blogger, Rachel Green, from The Perspicacious Bookworm recommended it to me via Goodreads. I know very little about this post-apocalypse story beyond its basic premise and what’s written in the blurb, but a few of the people I follow on Goodreads have reviewed the book, and opinion of it is definitely mixed. I bought this self-published fantasy novel last year and I’ve been meaning to read it for quite a while. 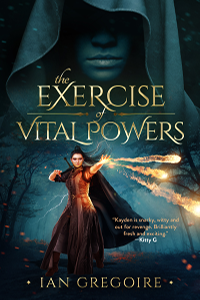 In terms of English language titles, there aren’t nearly enough fantasy books being published that stray from the well-worn, conventional medieval European inspired setting in their stories, so I’m really looking forward to discovering what Rosalyn Kelly’s debut novel brings to the diverse books table. I did read an excerpt from the book a while back, and that little taster was more than sufficient to make me believe Melokai is a book I will enjoy. And the reviews I’ve seen for the book have generally been positive so I have no concerns about it. So, these are the books I plan to read during April. With the exception of Hinterland, none of these books have particularly high page counts which should (in theory) make it easier for me to read them all before the end of the month. I’d certainly be disappointed if I don’t finish at least three of them. If you have already read any of the titles on my list, let me know what you thought of them, and if you have any books that you plan to read this month feel free to share which ones. I hope to read King of the Wyld and Melokai. I have read Station Eleven for my book club a few years ago. It wasn’t the kind of book I would normally choose, but I finished it and enjoyed it. I look forward to seeing what you think of it of all these books. The premise of Station Eleven sounds good so I hope I’ll be in the camp with those readers who enjoyed the story. Kings of the Wyld and Melokai are recent additions to my TBR as well! I need more diverse fantasies vin my life right now as I’m also a bit bored of the typical settings and tropes. Excited to read your reviews for both books! Hinterland sounds really good. and I want to read Kings of Wyld too. Hinterland started out great; the first hundred pages had me convinced it would be at least as good as the first book. Sadly, it went downhill as the halfway point was approaching and hasn’t recovered. I have another 80 or so pages to get through but it definitely won’t be getting 5 stars from me.